Migrating Stories is an artist’s research project, initiated in Lesbos, at a critical time in history. “This project was initiated through a new partnership between Arts Cabinet and Adger University, who purchased a monastry in Lesbos 30 years ago, which they use as a campus. This year for the first time Adger university has launched a summer school in this campus, from which they are teaching art-based ethnography to university students. I was invited to visit the summer school where I tested ideas in my own practice which I introduced to MA students in the form of a workshop. Trained in art and anthropology, I employ visual research methods and paricipant observation to examine notions of place and heritage. My PhD project at Goldsmiths critically examines current debates around assimilation and emplacement in museum and migration discourse by paying attention to how places are experienced and constructed by diasporic communities, and through participatory means of producing museum texts that broaden authorship in museum to include new voices and different perspectives. Through my art practice I set out to research parallel and collaborative projects between the Museum of London and supplementary schools and how paricipatory methods can help understand how yound people perceive cultural heritage in relation to place. As a response to the critique of the ‘spatial’ turn in anthropology, recent research has moved towards a ‘material’ turn to describe the reality of place in the experiences of migration. Following from this, I propose that it is necessary to return to metaphor in order to take into account the imaginative interpretations of place, to understand how creativity is used in processes of placemaking and to open new possibilities of being in place. My research is based in London, and going to Lesbos was an opportunity to see how these ideas translate into this new setting . 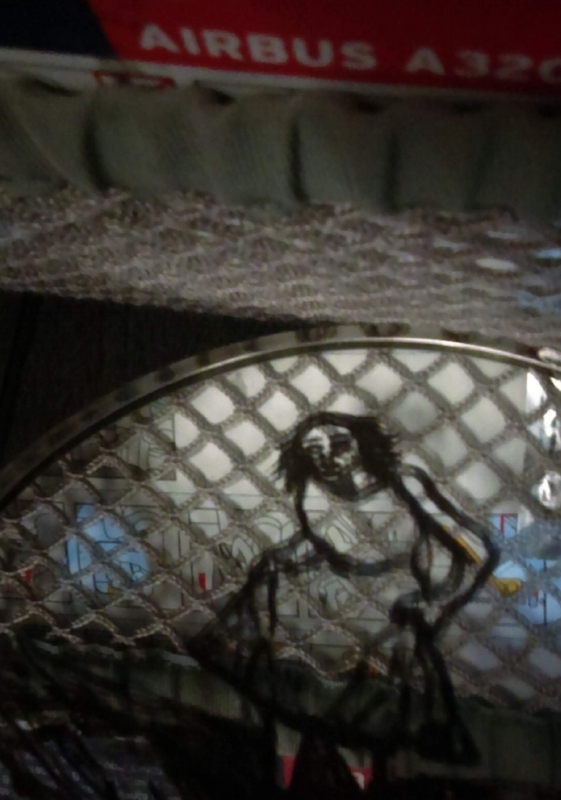 Having just completed a book called ‘Drawing as Performance’, I was keen to test out one particular task in which the artist draws on a mirror as a way to insert a new narrative into a public environment, to consider the relationship between imagination and reality and what happens when the two come together. Orly Orbach creates open books, performance graphics, and visual narrative landscapes using diverse interactive and participatory methods. Her work included commissions and residencies in regional and national museums, collaborations with architects and theatre companies, performers, and leading creative arts organizations. She is currently completing a PhD in Visual Anthropology at Goldsmiths looking at collaborations in heritage-making between the Museum of London and supplementary schools, and her book ‘Drawing as Performance’ is to be published by Routledge in December 2018. In Athens airport, changing flights between Terminal A and Terminal B, there is a small museum. It contains original artefacts, replicas, spot lights and interpretation, in all ways that point towards a ‘real’ national museum. Its location, above the airport shops in a busy airport, brings to question what a museum is meant to do, and at what point a room with artefacts ceases to function as a museum. ‘Airport museum’ brings me to my core topic- migration and heritage – and questions regarding how cultural heritage is transmitted in public institutions and private domains, in a multicultural context where diversity is celebrated yet difference is not always tolerated. ‘Airport museum’ is one of many hybrid institutions I came across during my short stay in Lesbos. Around the corner from where I was staying a tourist hotel allocated time-slots to be used as classrooms for refugee groups. Behind the port, a community-centre functions like a hotel, where long-term activists behave like tourists, having to regularly leave and return in order to meet the requirements of their visa. This makes visible that it is not only individuals and populations, but also institutions that have ‘hybrid’, multiple or complex identities. For me, drawing is a relational and processual activity, a way of co-discovering and reinterpreting different viewpoints. Our roles as artist and researchers cannot be about reflecting an objective reality, our subjective position always distorts our observations in the field. This is why the ‘Mirror Exercise’ can be a good starting point to respond creatively to place. By working physically with mirrors, I hoped the students would inevitably catch their own reflection in it, as a literal exercise in reflexivity and positionality, asking them to consider their own subjectivity, how they frame the field, what they leave out, what they tried to capture but is fleeting or out of reach. I handed each student a portable mirror and pens, and invited them to sketch or write directly onto the mirror’s surface, and use it as a temporary and changeable canvas. Seeking what distinguishes the field of anthropology from other disciplines, Ingold writes: “we do our philosophy out of doors. And in this, the world and its inhabitants, humans and non-humans, are our teachers, mentors and interlocutors. (Ingold 2007:83) This sentiment was much in keeping with the mirror-drawing exercise that encourages an open, collaborative approach to research. Using a mirror instead of a piece of paper, your field-notes are exposed, your research – as documentation and action - becomes visible. People, the changing landscape, weather conditions and different materials find themselves entangled in your fragile diary, intentionally stepping in to take a closer look, or accidentally caught up in the reflection. Trying to document the mirror in the field, you become aware of how changeable a place is. 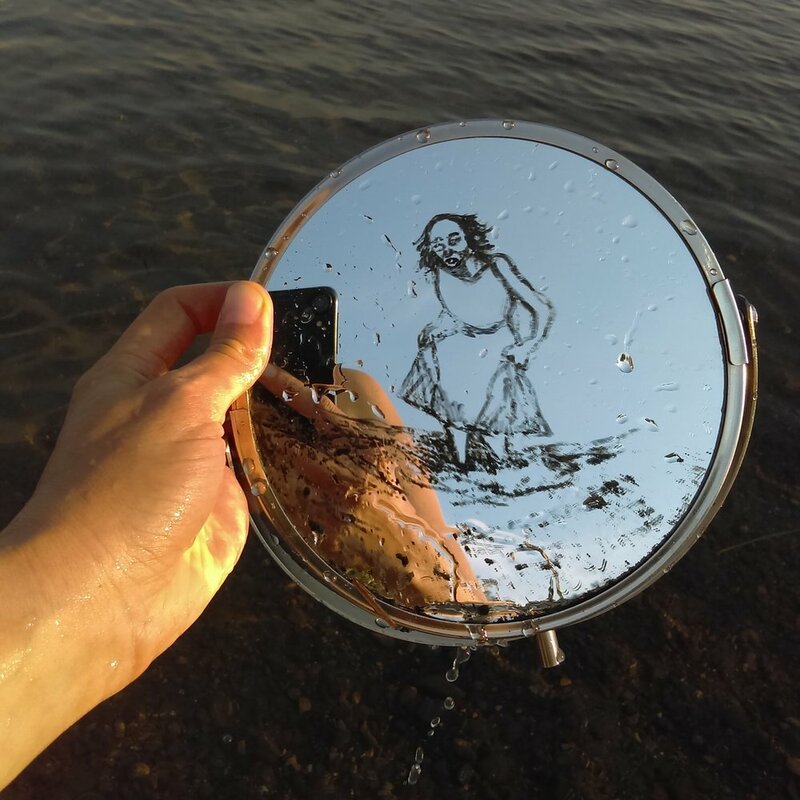 This summer I set a group of MA arts-based ethnography students and myself a simple task: to take a portable mirror and use it to make fieldwork notes, drawing and writing on the surface of the mirror as a page of a diary or sketchbook. By uncanny coincidence, I have devised the mirror-drawing exercise a few months before attending Ingold’s talk at the RAI, and was about to try it out for the first time shortly after. The mirror-drawing exercise is meant as an introduction for artists and ethnography students seeking to work in public spaces, as a practical way consider ethical, social and technical problems of participatory practice, and an imaginative way to ‘enter the field’. — Tim Ingold, speaking at the Art, Materiality and Representation RAI Conference at the British Museum, June 2018. I used my portable mirror to think of how narratives move through a landscape, and to see how they might be incorporated or rejected by different environments, or else how they could gain new meaning. This is how I remembered the folk-story: the old women of the village bathe in a secret pool that rejuvenates them. A granddaughter tags along. ‘You can watch, but promise you won’t cry and will wait patiently for my return’, warns the grandmother. The granddaughter promises, but is unable to contain herself, and cries in horror when she watches her grandmother enter the water that washes off her old skin. The grandma is forced to hurry back to shore to comfort the little girl. And ever since then, because of the girl’s doubting and interruption of the ‘process’, death becomes a reality. Magic and transformation is lost. The drawing I made prior to visiting Lesbos is of a woman, or perhaps a girl, stepping into the waters, uncertain. She might be Ophelia, weighed down by her dress. The picture was incomplete, and it seemed open enough to take with me to the field. Here, by the sea, the story gained a social life and meaning. Trying to photograph my mirror, I was redirected by a passing fisherman to photograph his boat. It seems this was not a drowning Ophelia, but a girl stepping onto dry land. 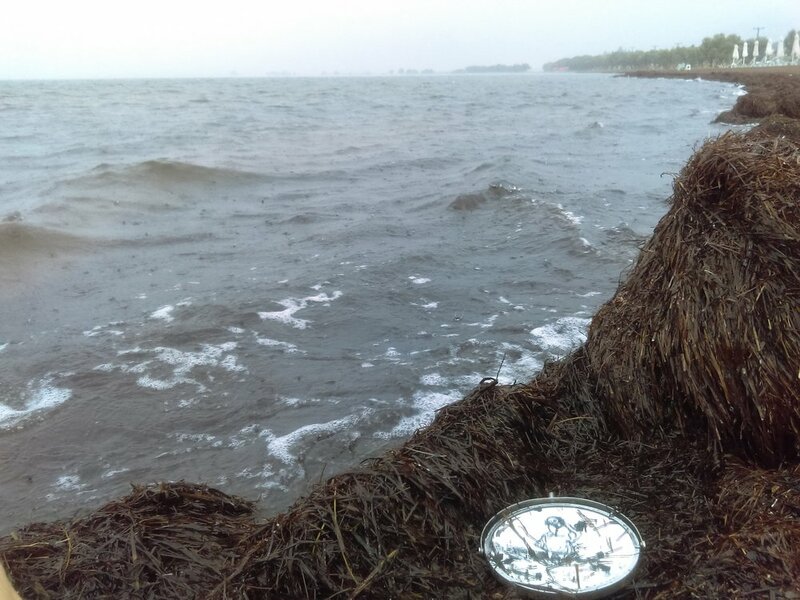 Later, caught in a thunderstorm, when everyone sought shelter and the world seemed to pause, I took the mirror to be washed by the waves. I spoke with a tutor from Agdar university. She told me a moving story about swimming together with a Syrian family on an open beach, where no IDs are required. The young girl in her story was not a confident swimmer, and entered the waters with trepidation, fully dressed, like the girl in my picture. The girls swam close by to the tutors, in search of reassurance. On leaving, I took the story to the airport with me, and whilst queing photographed it in fragments, as I entered the plane. I tried to merge the swimming figures into the mountainous backdrop, but here the story gained a new mearning, it was not longer a story about learning to swim, but about who gets to fly. My ongoing research is concerned with processes of representing and transmitting cultural heritage, in museums, where stories are already fragmented, reshuffled, disordered and repackaged, and in more private settings. Working with diasporic communities, who are often invited to work with museums in a positive effort to be more inclusive and representative of contemporary audiences, there are many common questions, not just about the sorts of narratives we are producing, as artists, researchers, ethnographers, but also how we are producing them. What possibilities are there for co-authorship, and in what circumstances do stories, myths and recollections have the power to transform? The day before leaving, on a sunny spell between thunderstorms, I approach a local mother and daughter with my mirror from London, and ask them to interpret the story. They ask me is he real? What do you mean, I reply. ‘Did you see him?’ No, I reassure them, this drawing is from my imagination. They are relieved, it seems. They looked at the drawing and told me that the man in the picture is homeless, carrying two shopping bags. The daughter thinks he is going home to his family. The mother disagrees: ‘he is a homeless, he lives under a bridge’. He is tired, she tells me, he wants to go home. Before leaving, I dip the mirror in the water once more, a second baptism. The text is lifted off, but most of the image remains in tact. I consider the ephemerality of stories. Back in London, I speak with a friend from the Migrant Resource Centre. We discuss the use of narratives themed around migration in the arts, politics, psychology and media, their possible short-term effects, but what stays in the public imaginings in the long-run: what sorts of actions, sentiments or politics might they mobilize?